For me food solves everything. It started when I was wee and I’d fall over and come in crying. My mum would always sit me on her knee and then cook me one of my favourites for my tea! Food can repair and mend, making everything ok again. That truly unique and wonderful power that it has, has brought comfort to many a wee laddie and grown man. 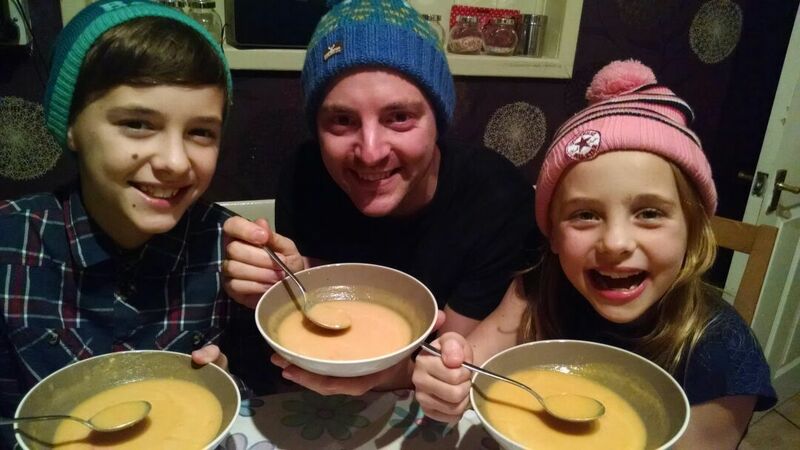 Me and the kids enjoying our soup! When its cold outside, like it is now, our bodies begin to crave substance and because we need more energy and can feel its effects almost immediately, warming us up from the inside-out, comfort food becomes even more important. I think this is why our favourites tend to be the warming winter stews, thick soups and stodgy puddings. These are the foods that make us smile – I have never heard of a salad giving someone a hug! Food that hugs you gives you a full belly and a happy face; it fuels you like your own internal log fire; it makes you feel invincible. What makes me love this food even more is that it drives people to ditch the frozen pizzas and crap burgers. 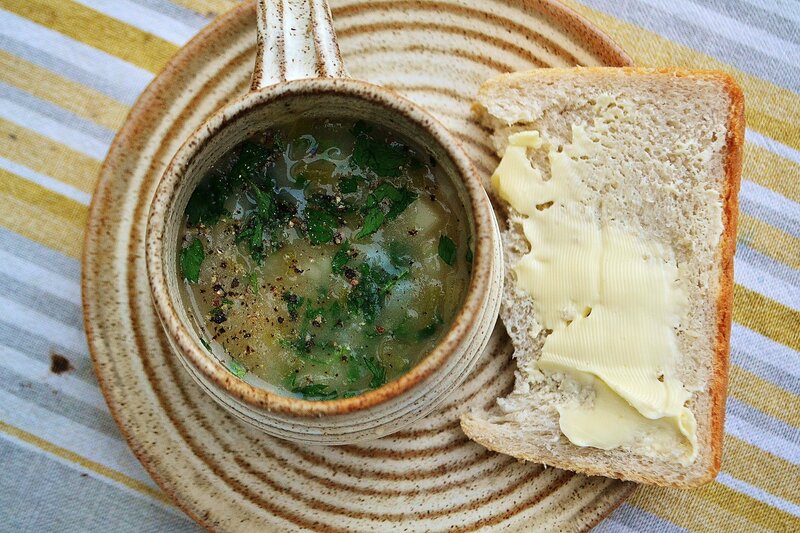 When we think of comfort, we go back to homemade soups and our mum’s macaroni cheese. When I get into the comfort food zone my eyes glaze over and my head fills with steak pie, mince and tatties and lentil soup. It’s good, hearty Scottish cooking and I think it’s all down to the great Scottish weather. We cook like this because we have to deal with minus temperatures and standing for 20 minutes trying to get into the car – porridge is the only thing that will fuel you for that! Bran flakes are never, ever, setting you up for de-icer spraying and rigorous windscreen scraping! When you come in from the cold, nose red and running, body tingling, the only thing that will do is a plate of stovies. 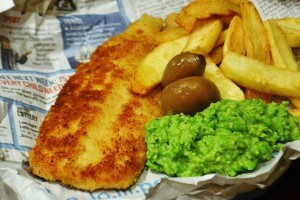 Us Scots have evolved into lovers of comfort food as a matter of necessity! So, apart from my mum’s soup, here is my favourite Foods That Hug You! Not quite Anstruther but tasty all the same! You need to go to Anster when the weather is wild and the wall opposite the chippy is cold. Autumn is perfect Anstruther weather. When the wall is freezing and your bum is cold and you open up that packet of steaming hot fish and chips there is nothing better. The smell on your fingers, the hot chips on your cold breath, eating it next to the water in contented silence. That is a perfect family day out. Not desserts, puddings. I want pudding that nails me to the chair! I rarely eat it but when I do it has to be apple crumble or my mum’s sponge and custard. It takes me back to being a child. This is newer comfort food for me. My wife Fiona makes it and me and the kids love it. It just reminds me of being with family and cos it’s simple and it all scoops up in one forkful it ticks all the boxes of what comfort food should do. Comfort foods have evolved a wee bit – my kids love their mum’s Spaghetti Bolognese in the same way I love my mum’s mince and tatties. I don’t really care what it is they want when they fall over, I just care that they are so well cared for that they have this in their lives. Fiona is a great cook, and while I’m beavering away at 63 filling the stomachs of our guests, she’s at home cooking proper meals for our kids. Which is every night of the week except Sunday and Monday. So, I cook Sundays (well, every second Sunday…!) and when I do it’s a one pot roast with everything thrown in. Chicken, veg, tatties… Heaven! Maybe it’s not just the weather. Maybe when it’s done with love and when it hits that perfect spot, food becomes something of a best friend, a friend that will hug you perfectly when you need it the most. Have a wonderful, peaceful and safe Christmas.